Professor Shakhashiri began by saying he’s distressed by the news from the East Coast where rain from Hurricane Sandy is causing devastation. He also said we must learn more about weather phenomena. Nature can be wonderful, he said, but also dangerous if we don’t have enough knowledge. Larry pointed out that satellite tracking predicted the landfall of Hurricane Sandy, but that weather experts say there will be a gap in satellite coverage. Professor Shakhashiri said the University of Wisconsin-Madison has been a pioneer in the use of satellites because of Professor Verner Suomi, who first proposed the idea and developed the first weather satellites. Professor Shakhashiri said a proposed 13 billion dollar program would provide better information and better predictions. Larry said there was warning well ahead of Sandy’s landfall or the result in human lives and injuries would have been much worse. Professor Shakhashiri said he traveled back to Madison this past weekend sooner than anticipated because of the impending storm. A caller said he got a certificate from the American Chemical Society recognizing 60 years of membership and signed by ACS president Bassam Shakhashiri. The caller joined as an undergraduate at the University of Illinois and said he’s been interested in science since grade school. Professor Shakhashiri said he’s a 50 year member of ACS, the largest professional science organization in the world with 164,000 members, and added that it was his pleasure to sign the certificate. Larry remarked that in some circles, science is considered a bad thing and people reject its findings. Professor Shakhashiri said that’s very sad and it represents a failure of education. Our biggest challenge, he continued, is to sustain the Earth and its people in the face of grand challenges such as disease, war, violence, climate change and denial of basic human rights, especially the right to benefit from progress in science and technology. What we don’t know can hurt us, Professor Shakhashiri said, and it’s everyone’s duty to combat ignorance. While the Industrial Revolution has brought great benefits, it has also brought other consequences such as global climate change, he said. The American Chemical Society has developed a climate science tool kit available at its website. Professor Shakhashiri asked Larry, and the audience, a question concerning global warming: Which gas is responsible for the largest fraction of the greenhouse warming effect. Is it: methane, ozone, water vapor or carbon dioxide? Larry said water vapor, and he was correct. Larry had his own question: How do you measure the temperature of the Earth? Professor Shakhashiri said the tool kit describes how it’s done and answers many other questions as well. Larry said callers tell him they have friends who just don’t believe in global warming or other findings of science. Professor Shakhashiri said the tool kit was one of his presidential initiatives and that the site includes a place for comments. A caller said the founders of the United States were people of reason and science, and these values are now being denigrated by some. He said oil and gas interests are spending big money to challenge the idea of global climate change and asserted that Wisconsin Senator Ron Johnson is one of the biggest offenders in denying global warming. The caller said he has contacted Johnson, who doesn’t see the economic opportunity but only problems. Professor Shakhashiri said he’s an advocate for economic progress, but his concern is to make collective decisions based on fact that benefit everyone. He decried the lack of respect in public dialogue, saying that he hopes before he dies to have an intelligent, respectful dialogue on global climate change and evolution. A caller asked, “Do we take science for granted?” Professor Shakhashiri said we take a lot of things for granted, but through education we can inform ourselves and others about how inventions happened as well as their pluses and minuses. “Once an invention is made,” he continued, “you can make responsible decisions on how to use it.” Science isn’t the answer to everything, he said, and citizens should appreciate the benefits and the limits of technology, but science can help people understand technology and its consequences. Above all, science and technology should serve the community, he said. A caller asked whether chaos theory puts a limit on the time frame of weather prediction. He said some experts say that weather is so complicated, predictions beyond two weeks are impossible. Larry said he has climatologists on his program the fourth Monday of each month, and he will ask them. He has already discussed the subject with William Logan, author of Air. Professor Shakhashiri asked why the caller brought up the subject. The caller said he was not against technological advances, and that the subject has nothing to do with climate change, but that he wonders about the limits of science. Professor Shakhashiri said he would look for the book, and added that this is why we do research, to find the limits and capabilities of science. A caller said he was working as a lab assistant 50 years ago when Rachel Carson’s book Silent Spring came out. The caller said the book had an enormous impact on the world and showed that one person can make a difference. He also said it was industry, not science, that attacked Carson. Professor Shakhashiri called Carson a scientist/citizen who did mankind a huge favor by helping everyone understand and appreciate what we are doing to the environment. Advances can be useful, he said, but we must be concerned about the consequences. Professor Shakhashiri named two other scientist/citizens: Sherry Rowland, who won the prize in chemistry for his research on the effect of ozone on the stratosphere, and Linus Pauling, the only person to win two Nobel prizes in unrelated fields—he won the prize for chemistry and the Nobel Peace Prize. A caller asked about HAARP (High Frequency Active Auroral Research Program), a system that claims to regulate weather by using radio frequency. Professor Shakhashiri said he had never heard of it, but promised to look into it. More information can be found here. Professor Shakhashiri also congratulated Larry for receiving the 40 in 40 Impact Award from the University of Wisconsin College of Agriculture and Life Sciences (where Larry is a professor of communications). The award goes to the 40 people who have had the greatest influence on the College over the last 40 years. A caller said the late Don Herbert (television’s “Mr. Wizard”) instilled in him a lifelong interest in science. Professor Shakhashiri said Herbert and his wife Norma were good friends and that Herbert was a mentor who taught him the importance of communicating the joy of science. Professor Shakhashiri dedicated one of his books on chemical demonstrations to Herbert, and noted that Herbert was from LaCrosse, Wisconsin. Professor Shakhashiri said that Sputnik, the first artificial satellite, was launched by the USSR a few weeks after he arrived in the U.S. and changed American attitudes toward science and science education. The U.S. took Sputnik as a call to action, to make sure that we in the United States appreciate the value of scientific and technological advancement. It was a rallying point that resulted in a great deal of very thoughtful federal programs aimed at recruiting young people to go into science and science education. We need another rallying point now, Professor Shakhashiri continued. While there are pockets of excellence, and the colleges and universities of the U.S. are the envy of the world, he said that we can and must do better. A caller said he became interested in science at a young age because of the influence of a book of experiments for young people. He didn’t remember the name of the book, but Professor Shakhashiri said there are many such materials available today. One example of this is his website, which contains a section on experiments you can do at home with ordinary household materials as well as a list of recommended readings and recommended websites. 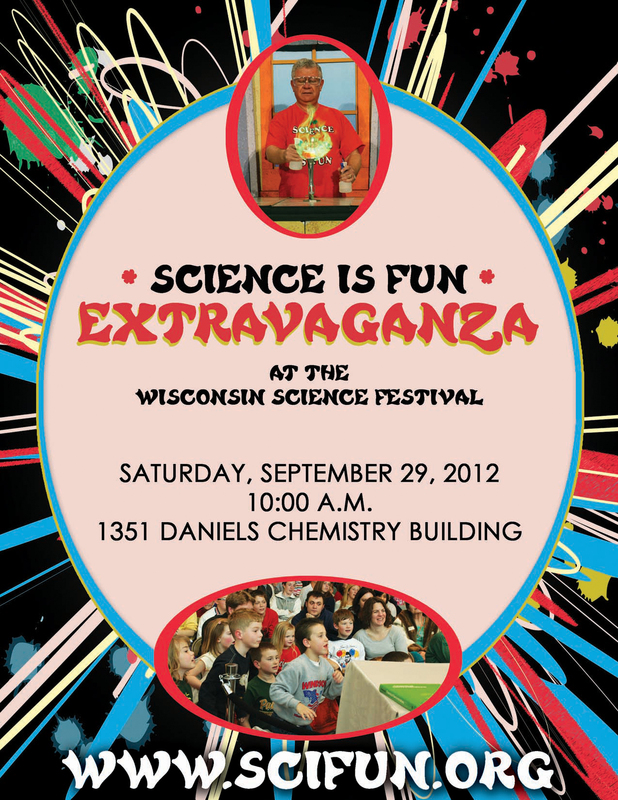 Professor Shakhashiri also noted that the Wisconsin Science Festival is coming up next week. The three-day festival will include free events in many parts of the state. The festival was first suggested by Professor Shakhashiri in an article published in 2009. He will be offering an “extravaganza” of chemical demonstrations at 10 a.m. Saturday in the chemistry building on the University of Wisconsin campus. The goal of the festival is to increase participation in science in communities around the state with hands-on, minds-on activities, and will also feature many interesting speakers. Larry noted that Wisconsin Public Radio is a co-sponsor of the festival, and will present a live radio drama of 20,000 Leagues Under the Sea. A caller asked where the oxygenation of water in a fish tank occurs, at the surface or through the bubbles? Professor Shakhashiri said it’s both. While the surface provides the greatest area for oxygenation, the bubbles from an aerator also combine to provide a large surface area. A first-time caller asked whether Professor Shakhahsiri knew Carl Sagan, Richard Feynman or other notable scientists. Professor Shakhashiri said both were great inspirational figures in communicating science. He knew Feynman only through is work, but Professor Shakhashiri said he knew and worked with Carl Sagan. Sagan worked with SETI (Search for Extraterrestrial Intelligence) which was pioneered by Frank Drake, Professor Shakhashiri’s brother-in-law. Sagan and Professor Shakhashiri appeared together many times at public forums, advocating for science literacy. Both Sagan and Feynman had big egos, Professor Shakhashiri continued, but used their presence to reach wide audiences, including people who would not otherwise have been reached by scientists. “They are heroes of mine,” he said. While Sagan was ostracized by other scientists for his “popularizing” of science, Professor Shakhashiri said there are now many scientists using the media to communicate science. He also praised Larry for inviting many scientists to appear on his show. The next question came in via email, from a grandmother who feels that it is her responsibility to help instill a love of science in her grandchildren, but is wondering how to start the process. Professor Shakhashiri praised her for helpling to cultivate the curiosity that all youngsters have. His answer was that she should read to them—not only about science but about everything. He also recommended listening to music with them and taking them on nature hikes. Above all, encourage them to ask questions, like, “Why do the leaves turn color in the fall?” Surround your family with the beauty of asking questions, while realizing that instantaneous answers are unrealistic. Professor Shakhashiri advised the listener to be firm but also patient and loving while nurturing curiosity. He invited listeners to respond to this website with comments, recommendations and questions. He tries to answer all questions that come in via his website and email, with the exception of students asking for answers to homework problems! Paul Kinzer, an astronomer who often appears on Larry’s show, called to tell Larry that he loves coming on his show because Larry encourages people to call and ask questions. There are science questions everywhere, he said, and asking them nurtures curiosity. Professor Shakhashiri said he constantly learns from being asked questions, and the joy of learning comes from better understanding our beautiful and complex world. We must also be participants in protecting the Planet, he continued. While the Industrial Revolution greatly improved out standard of living, it also brought new concerns such as pollution and global climate change. Larry mentioned that the caller, Paul, spends time teaching children about the stars, and has a portable planetarium that he can set up in different locations. A caller said there’s a need for scientists to share their knowledge with the medical community. He said doctors too frequently ignore the findings of science. Even though it’s been known for several years that bacteria cause stomach ulcers, he said he knows a doctor who is still using outdated treatment. Professor Shakhashiri said that when he speaks about science, he means all sciences, and that includes medical sciences. While scientists are good at communicating with each other, he continued, we are not as good yet at communicating with the rest of the population. Scientists have an awesome responsibility to share their knowledge, and part of the joy of being knowledgeable is to share it with others. Sharing with others can have immediate practical applications. Scientists should have the right attitude, as part of the greater human community to which we all belong, and share their knowledge for the benefit and enrichment of everyone. A caller said Professor Shakhashiri should get the “Dr. Oliver Sacks Award” (which she made up) for caring as much about people as he does about science. The caller is an admirer of Dr. Sacks, a neurologist who has written many popular books. She said, “You are to teachers as Dr. Sacks is to doctors. Thank you very much for being you.” Professor Shakhashiri said Sacks is a friend of his, a scientist citizen like Sagan and Feynman, and he promised to call Sacks right after the show to pass along the compliment. A caller who identified himself as a former student of Professor Shakhashiri’s in freshman chemistry 41 years ago, said he went on to earn a PhD in public health and asked for comment on the disconnect between science and politics over issues such as toxic chemicals and global climate change. “Politics has taken over, and we don’t listen to the scientists,” he said. Professor Shakhashiri said there’s nothing more rewarding as a teacher than hearing from former students. He said the level of science literacy is low in American society and there’s a need for better communication between science and the rest of society. He noted that the taxpayers have been very generous in supporting scientific advances, and people found the will to fund science and technology, through organizations like the National Institutes of Health, the National Science Foundation, Department of Energy, NASA, etc. “We have a responsibility as scientists, not only to make new discoveries, but to pay back to our fellow citizens, and live up to the social contract that science and society have,” he continued. “Our fellow citizens need us, we need them, and scientists must find effective ways to communicate successfully with all parts of society.” More elaboration on these points can be found on his website, in the Statements and Writings section. Professor Shakhashiri revisited his earlier question about why the leaves change color in the fall, (there’s an article about it on his website) and Larry began to answer by saying that it has to do with change in sunlight and temperature. Professor Shakhashiri said that he was right, and added that change in humidity factors in as well. He said that all colors are present in leaves, but the green chlorophyll predominates and masks the others. When chlorophyll production declines in the fall, due in part to the factors that Larry mentioned, the other colors become more apparent. Finally, a caller asked how salt works to soften water. Professor Shakhashiri said the hardness of water is due to minerals dissolved in it, particularly calcium and magnesium ions. In a water softener, the water is passed through an ion exchange column, where the calcium and magnesium ions are exchanged for the sodium ions from the salt. Professor Shakhashiri then posed a question back to the caller: why do we want to soften the water? The caller said that he does it because his wife doesn’t like cleaning the rust out of the bathtub. The professor agreed that that is useful, and also said that in hard water, calcium combines with the carbon dioxide and forms a solid calcium carbonate, which we see as a white deposit. Calcium carbonate and magnesium carbonate are insoluable substances that build up in the bottom of the water heater, which can clog it up (usually, only the hot water is softened). Larry and Professor Shakhashiri extend their condolences to the family of Jim Packard, and the entire Wisconsin Public Radio family, concerning his death earlier this week. Before his retirement, Jim served as producer and substitute host of the Larry Meiller Show, among his many duties at Wisconsin Public Radio. Larry, who worked with Jim for many years, said Jim was an excellent producer and host, and had a great sense of humor. He will be missed. Professor Shakhashiri, who currently serves as President of the American Chemical Society, travels the world as part of his duties and says it makes him more aware of the great challenges we face as a society. Among them are sustaining life with finite resources, and providing clean drinking water—even in the U.S. And while part of the world suffers malnutrition, other parts of the world have a growing problem of obesity. Professor Shakhashiri called for intelligent conversations regarding two controversies, concerning the teaching of “creationism” or “intelligent design” in science classes, and global climate change. We now know there will be major consequences from global climate change, he continued. Professor Shakhashiri said that while the Industrial Revolution has resulted in greatly enhancing the quality of life, there are dire consequences from what we are putting into the air. He said the discussion should be about what to do to protect the quality of life on Earth. Professor Shakhashiri said we should be up to meeting the challenges because science is based on curiosity, and the more we know, the more we realize how much we donʼt know. Discovery is a great part of the joy of being a scientist, he continued. A caller who identified himself as a physics teacher working on the next generation of science standards for teaching, wondered where the next generation of young teachers will come from. Professor Shakhashiri said thereʼs a need for quality teachers. While there are pockets of excellence in teaching, he continued, the turnover of science teachers is too fast. Teaching is a noble calling, he continued, but society must provide incentives and rewards to keep people in the profession. Professor Shakhashiri hopes that quality teaching will be an issue in the next political campaigns. Larry remarked that science teachers are often hired away from the profession. Professor Shakhashiri said heʼs in favor of people taking advantage of opportunities, but added that the business community must also take responsibility for education. Science is one of the most important forces affecting society, he continued, noting the vast difference between life today and life 200 years ago before the Industrial Revolution, mostly due to discoveries of science. Science is a human endeavor, Professor Shakhashiri said, motivated by curiosity and the thrill of discovery. Science canʼt solve all problems, he continued, but is based on enlightenment, which is a whole lot better than ignorance. A caller, who participated in the first Earth Day in 1970, said she still regularly picks up litter along the highway, and wondered where the children are who could help with such work—she said it might help combat childhood obesity. Professor Shakhashiri said we should all take personal responsibility and a good start would be asking what happens to garbage. “We are custodians of the planet”, he said, noting the 50th anniversary of the publication of Silent Spring by Rachel Carson. The book was a critique of chemistry, in part, and a wake-up call for chemists. The book is still controversial, he continued, but has profoundly impacted the practice of chemistry. A new branch of chemistry, called Green Chemistry, has emerged, with the basic idea of making fewer polluting chemicals in the first place, rather than trying to clean them up following a manufacturing process. Chemists must demonstrate to everyone that we value sustainability, he continued, and we must be part of a responsible solution so that everyone can continue to enjoy the beautiful chemical world in which we live. A caller asked about the job market for graduates with degrees in science and engineering. Professor Shakhashiri said the job market is not as good as it should be, but the unemployment rate is about half the rate for all unemployment. However, he added that the U.S. is falling short in science and engineering when compared with other countries, especially China. China is now attracting top university faculty from the U.S., he said, and the thousands of Chinese students who are still coming to the U.S. are returning home to much improved higher education in China. This is a tribute to the American system of graduate education, but he added that thereʼs a great need to attract more native-born Americans to science and engineering. Professor Shakhashiri also called for a more educated citizenry that appreciates what science can do, and what it cannot do. A caller said he got into a heated argument with people who insisted that teaching creationism in science classrooms is consistent with scientific inquiry. Professor Shakhashiri said heʼs in favor of open discourse, but there is no scientific or rational foundation for creationism and it does not belong in a science classroom. Professor Shakhashiri said the beliefs of others should be discussed openly and all should be respected as fellow human beings even when there is disagreement about beliefs, but that creationism is not valid and doesnʼt belong in a science classroom. A caller asked what can be done about climate change. He said the church was the leading opponent of science, but now politicians are in the pocket of big polluters who oppose science. Professor Shakhashiri said we must combat ignorance everywhere. He said religion and science are not necessarily opposed—they deal with different domains of life. But the consequences of climate change can be catastrophic, he added, and the electorate must be educated. Professor Shakhashiri had not appeared on the Larry Meiller Show for some time because of his duties as president of the American Chemical Society, the largest professional organization in the world with more than 164,000 members. The responsibilities require Professor Shakhashiri to travel more than ever, and he participated in the show by telephone. Professor Shakhashiri is on leave from his position as Professor of Chemistry at the University of Wisconsin-Madison, and will return after his term as President of ACS. Professor Shakhashiri noted that he’s in his 42nd year at UW-Madison and he said it’s an honor to be part of the University. This is the sesquicentennial of the Morrill Land Grant Act, and Professor Shakhashiri urged listeners to check this web site for information about the Morrill Act and the Wisconsin Idea, including a summary of major contributions made by the UW-Madison. Among the contributions: Chemistry Professor and former ACS President Farrington Daniels conducted research on solar energy as early as the 1950s. There are many more achievements listed, and Professor Shakhashiri said the University is dedicated to improving the quality of life for everyone, not only in the state of Wisconsin but in the nation and the world. A caller asked how higher education works with K-12 schools to promote curiosity and scientific knowledge. She asserted that many students are unprepared for higher education, taking easier courses and apparently lacking in curiosity. Professor Shakhashiri said children of all ages are curious, though younger ones are less inhibited about exploration. He said it’s important to take advantage of what public and private institutions offer—there’s a wealth of information and commitment to provide motivation for students and teachers. Professor Shakhashiri said parents are important as well, and many WISL activities include parents. Learning takes place everywhere and science is all around us, he continued. The caller asked if there are summer camps for science as there are for sports and music. The answer is yes—look under “Events of Interest” on this web site for some opportunities. Professor Shakhashiri urged all listeners to take advantage of local offerings by checking nearby institutions: Saturday Science at Discovery, ICE Summer Chemistry Camps, Wisconsin Science Festival, Science Expeditions, Family Science Night at Edgewood. A caller identified herself as a teaching assistant for Professor Shakhashiri’s freshman chemistry course in 1993 and said she got her love of science from her father, who was a biochemistry professor. She emphasized that learning does not take place only in the classroom. Professor Shakhashiri said he hopes she’s telling others the same thing. Science helps us understand the world, he continued, and also the responsibility of dealing with the consequences of new discoveries. Science is not the answer to all problems, he said, because creativity and innovation exist in all domains. A caller asked about what he called exciting recent developments in cold fusion which he learned about on the internet. Professor Shakhashiri said cold fusion is not controversial in science because, in many years of research, it has not been validated. That doesn’t mean we shouldn’t study it, he continued, but cold fusion has not lived up to the claims of its backers. Professor Shakhashiri said the internet is very useful, but not all information is valid. Scientific publications have a peer review process, he continued, in which articles are checked, and once published, other researchers can try to duplicate the results (attempts to duplicate claims of cold fusion have failed). His advice: be skeptical. A caller said he’s proud of the UW System, but asserted that over the past 20 to 30 years, private funding has become a major factor in research, and wondered if it’s too late to reverse the trend of increasing corporate direction of research. The caller said private money comes with strings attached. For example, he said corporations tried to suppress negative findings about bovine growth hormone. Professor Shakhashiri said all the grants that he and his colleagues receive have no strings attached. As researchers form partnerships with the private sector, he said there’s always a clear understanding that the research will be open and published under peer review. Having strings attached would not be in keeping with the University’s mission, he said, and researchers have no boundaries put on them. A caller said he learned a lot about science from television, public television programs in particular but some on commercial networks as well, and he thanked Professor Shakhashiri for the annual Christmas Lecture, which is shown on public television stations. Professor said the Christmas Lecture, in the tradition of the great British scientist Michael Faraday, is one of many avenues for sharing the joy of inquiry. Professor Shakhashiri will offer a similar show June 25, 2012 on the UW-Madison campus. The show is free, but reservations are required because capacity is limited. Click here for more information. A caller said he doubts the existence of objective research. He said people are unaware of their biases. Professor Shakhashiri thanked the caller for raising an important question. He said one of the most difficult things in research is to formulate the questions to eliminate bias. He said we are a curious species, learning as a result of asking questions. We live in the most advanced technological society ever because our ancestors asked questions, he continued, and we have a responsibility to avoid biases. A caller identifying herself as a student of Professor Shakhashiri’s in 1971, and asked about pollution credits, in which organizations can buy pollution credits from those which do not reach their legal limit. Knowing what we do about the consequences of pollution, she asked how this can be allowed. Professor Shakhashiri said credits are one mechanism to move in the right direction but not destroy the economy. Pollution should be controlled, he said, not by regulation only, but by understanding the consequences in the long run. We must appreciate how well-off we are, he continued, and also be good stewards of the Earth.